Member of a respected lucha family. His uncle Sugi Sito is a legend, and his father is a reconigzable wrestler from the golden years of lucha libre. Made his debut on April 21, 1977, as Kuroneko, facing a wrestler called Mr. Bronce. He wrestled for UWA and he mostly as a midcarder at the promotion's small buildings like Arena Naucalpan and Arena Neza. He made his first trip to Japan on April of 1981 as a lucha opponent for Tiger Mask (Satoru Sayama). It was then when he changed his name to Black Cat. Well, in reality he had always been using that name, only in Japanese (Kuro = Black, Neko = Cat). Returned to Mexico in late 1982, but he eventually came back to New Japan. He wrestled there during many years as an undercarder and he can often be spotted at ringside during the promotion's cards. Joined AAA in February of 1994 as the masked Black Cat and became a founder member of the Los Gringos Locos stable with Love Machine and Eddy Guerrero (later Konnan and others would join them), basically as a replacement for Eddy Guerrero, who used to wrestle a lot of tours for New Japan as Black Tiger. Had a heated feud with Máscara Sagrada (original) and they had an awesome mask vs. mask match that surprised many, as nobody expected it to be THAT good. This was the semi-main event of the May 15, 1995 "Triplemania II-B" in Zapopan, Jalisco, and many experts and sheet writers rating it from the ****1/4 to ****3/4 range. Finish was classic, as Sagrada tombstoned Black Cat to lose the 2nd fall (Cat won the first one) but then Cat lost the 3rd fall as he was being stretchered out after the deadly martinete. Heat for this match was incredible. Cat returned to NJPW in September of 1994, wearing a mask, often teaming with Love Machine (also wearing a mask) and Black Tiger (Eddy Guerrero). He stayed there and kept wrestling as an undercarder, but he never returned to AAA. In June of 1996, a masked Black Cat II appeared in AAA but he was not the same wrestler. He had a few appearances for WCW in January of 1999 as a part of the NJPW/WCW talent exchange, but he had a knee ligament injury that kept him out for some months, and when he came back it was for NJPW. 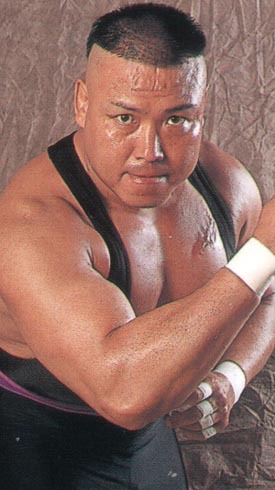 He had another injury on June 2000, but he made his return in early year 2001 as an active wrestler that also helped with the training of the promotion's young prospects. At some point around this time also became the official liason between NJPW and CMLL when it came to sending talent down to Mexico for training. Passed away in early 2006. This page was last edited on 17 September 2017, at 17:35.